For Audi, 2015 is rather different. Gone are the numbers 1 and 2 from the sides of the cars, gone is Tom Kristensen from the driving seat. Technical Director Howden Haynes has stepped away from Joest Racing too. Last year was an unsuccessful year for the Ingolstadt manufacturer. Even winning Le Mans came against the odds. So this year, the R18 e-tron quattro had to be better. It had to be a lot better. The decisions made in 2011 to use a flywheel energy storage system were long-term: by being first on the hybrid treadmill, Audi were not necessarily pushing the technological envelope. In any case such behaviour is somehow not in the company’s culture. Over the winter, a significant step would be needed to extract 4MJ from the hybrid system, and a good deal of other detail work would be necessary as well. By the time the Prologue at Paul Ricard came along in March, there were some encouraging times emerging, particularly on the longer runs. 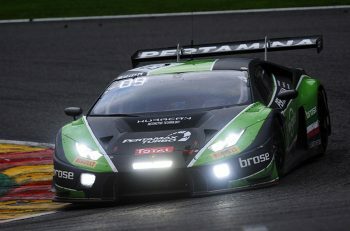 Importantly, Oliver Jarvis seemed up for the challenge of stepping into the seat vacated by Tom Kristensen alongside Loïc Duval and Lucas Di Grassi in the #8 car. 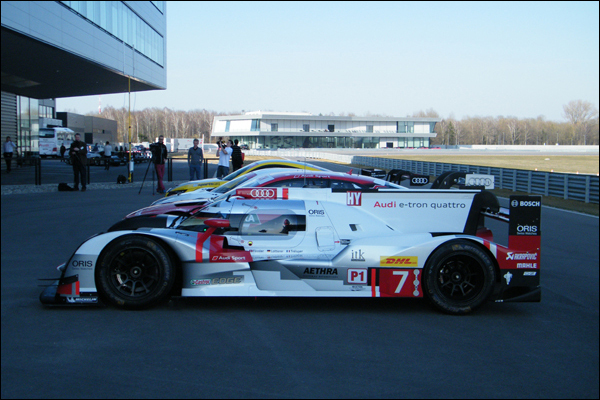 Before the cars arrived at Silverstone, Audi had already racked up more than 10,000kms in testing. 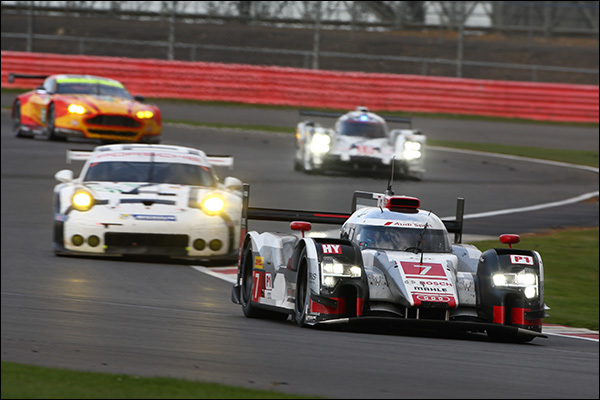 In the six-hour race, the two Audis were clearly, just, the class of the field. The race was devilishly close, of course, but both cars were capable of setting stint times quicker than last year’s nemesis Toyota, and critically, quicker than the works Porsche 919 Hybrids. The number 8 car lost time in the pits having damage repaired, but thereafter Jarvis was actually quicker than the number 7 car in the closing stages of the race. Since Silverstone, the team has been at both Paul Ricard and Monza testing. Monza is particularly useful, as it closely replicates, according to Michelin, the track characteristics of Le Mans. The test at Monza revealed, for the first time, the Le Mans-specification bodywork of the R18 e-tron quattro. In addition, by closely working with Michelin, Audi will be hoping that its tyre wear rates will be fully understood ahead of the 24 hours. 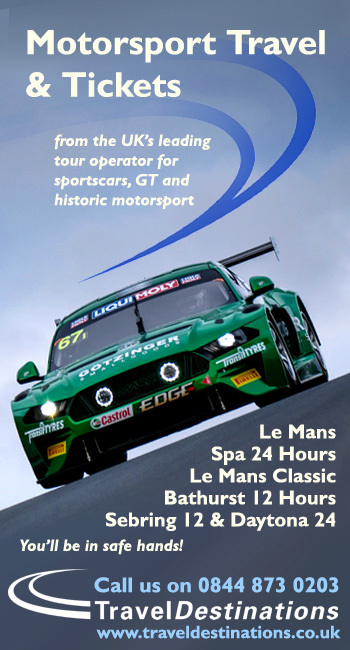 The Spa Six Hours, this weekend, will be a further opportunity to test the Le Mans aerodynamic configuration. Two cars, the number 7 and the number 8, will run in this configuration. If all goes well, then these will be the two tubs that will be taken to Le Mans for the Test Day on May 31st. The number 9 will run at Spa in high-downforce trim, but this is due as much as anything to the availability of the parts required to run three cars. This is surely an indication of the importance that Audi attaches to Le Mans. As reported previously, Toyota will be back at Spa with its Le Mans-spec cars in mid-May. By running theirs in the race, Audi will have the opportunity to go off and test again (somewhere warm?) between now and the Test Day, having gathered useful data from the race conditions in the Ardennes this weekend. 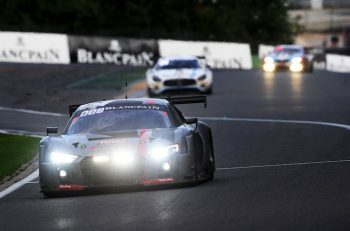 So what can go wrong for Audi at Le Mans? Well, quite a lot, actually. Despite the results at Silverstone and in testing, running with 4MJ against opposition that has 50 to 100% more means that sheer grunt down the long straights of Le Mans is going to be a problem. If Audi does get ahead, there are at least four places a lap where the Porsches will be able to utilise superior horsepower and just drive past. The chicanes on the Mulsanne straight are almost tailor-made for Toyota’s energy recovery system, based as it is on the braking systems only. 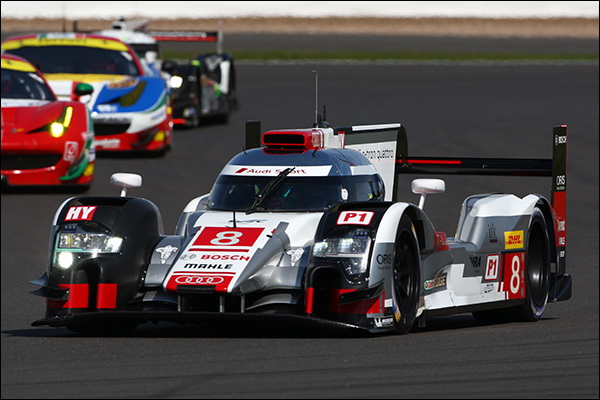 Audi has historically been able to make up for performance deficits through superior strategy and slick pit work. However, a couple of questionable calls were made in the Silverstone race that could have been costly. Firstly, the decision to leave the two Audis out for a lap when the first Full Course Caution was called cost them about thirty seconds. Chris Reinke defended the decision afterwards, explaining that, because Audi had the first two pits after the pit entrance, getting things ready for an emergency stop would have taken longer than for the cars further down the pit lane. Secondly, the late race penalty was taken immediately after a routine pit stop, meaning that the tyres had to go through two temperature cycles. It would have been equally possible and strategically more efficient, to take the penalty pit stop first, and then refuel on the following stop. 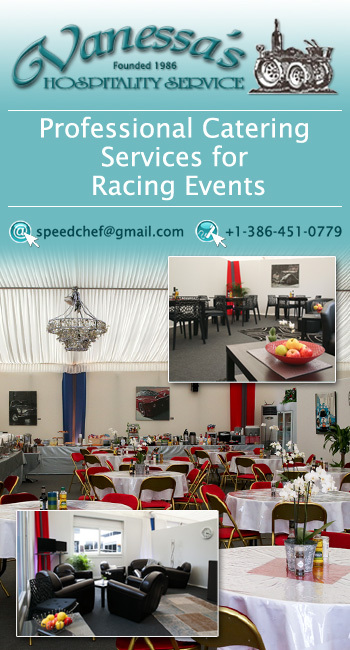 In the end of course, it didn’t matter at Silverstone, as Marcel Fässler, Benoît Tréluyer and André Lotterer had sufficient in hand to win the race, but at Le Mans they might not have that luxury. Last year’s 24 hours demonstrated that it was still possible to experience problems (Audi had to change the turbocharger on two of their cars last year; the other car crashed) and still win the race. The expectation must surely be that one of the manufacturer LMP1 entries will be able to go trouble-free this year? And, that means that dubious strategy calls are unlikely to go unpunished. Bear in mind that these words are being written before the Spa race. As already explained, this race is undoubtedly part of the testing and preparation for Audi Sport Team Joest. 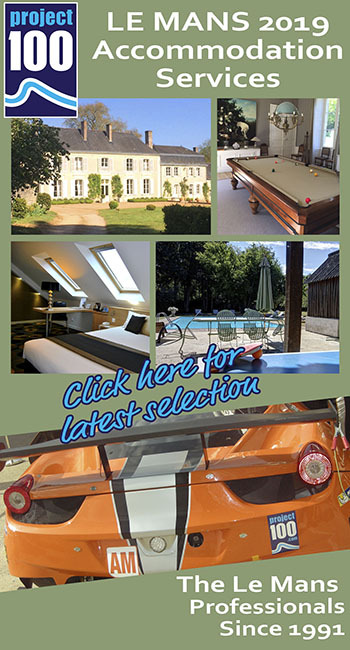 One, or possibly two further tests are planned ahead of the Le Mans Test Day. Thus far, it seems that Audi has done most of its sums right.